Birth of James Richards recorded March quarter 1892 at Dudley. 30 Brook Road, Woodsetton, Staffordshire. James Richards (53, Coal Miner – Hewer, born Sedgley), his wife Hannah (48, born Sedgley), and their 5 children: Joseph (26, Coal Miner – Hewer, born Sedgley), Annie (25, Tailoress, born Pendlebury, Lancs), Alfred (22, Moulder, born Sedgley), Thomas (19, Bricklayer’s Labourer, born Sedgley), and James (9, born Sedgley). James Richards (63, Coal Miner – Hewer, born Coseley), his wife Hannah (59, born Coseley), and 2 of their 5 surviving children of 8: Alfred (32, Moulder, born Coseley), and James (19, Goods Porter for London & North West Railways, born Coseley). Also their niece, Emily Jackson (22, Domestic, born Coseley). The British landed in Salonika in October 1915 to support the Serbs who were under attack from the Bulgarians, who had recently entered the war. The British arrived too late to prevent a Serbian retreat, and the single British Division (the 10th) was driven back over the Greek border. The 11th Worcesters, including James Richards, landed in Salonika in late November. The subsequent 8 months were spent in strengthening the defensive positions to the north of the port city of Salonika. In July 1916, with Milne as the new Commander, the policy of passive defence was abandoned; the Bulgarian out-posts on the steep ridges around the town of Doiran were to be attacked. During August the British attacked and took Castle Hill, Kidney Hill and Horseshoe Hill, thus denying the Bulgarians the high ground and gaining observation over their defensive lines. On 2nd September the 11th Worcesters took over the captured ground of Horseshoe Hill. During the subsequent week the Bulgarians fiercely bombarded the Worcesters position, four men were killed in action, and 3 men died of wounds. 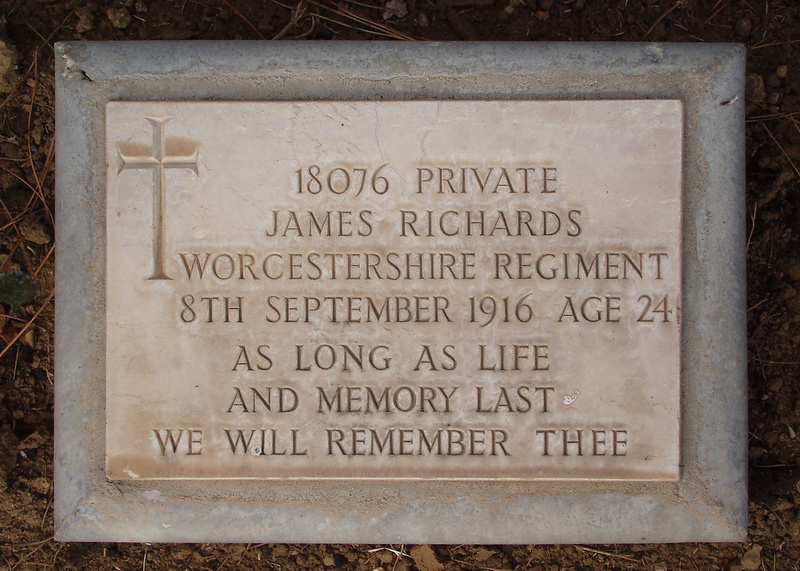 James Richards died of wounds on 8th September. It is likely that James was initially buried near Horseshoe Hill as 90 bodies were moved from there to Kalinova Military Cemetery in 1919. We can be certain that James was exhumed from Kalinova Military Cemetery in 1921 and re-buried in Karasouli Military Cemetery, about 15 miles south of Horseshoe Hill.